Our dedicated team have been busy preparing for the arrival of the Mojo range of prehistoric animal models. Shortly, Everything Dinosaur will be welcoming a total of thirty-two new models into the warehouse. Everything Dinosaur will be stocking all of the Mojo replicas in the “Prehistoric & Extinct” model range. Shelf space has been prepared and staff have been finalising the new prehistoric animal fact sheets that are sent out with every named model purchase. It’s not just dinosaurs in the Mojo range, “Prehistoric & Extinct” also includes several prehistoric mammals, nine in total, including a spectacular “classic” Brontotherium. The name Brontotherium (it means Thunder Beast), was established in 1873 by the famous American palaeontologist Othniel Charles Marsh, the scientist responsible for naming a number of iconic dinosaurs including Stegosaurus, Triceratops, Allosaurus, Diplodocus and Ceratosaurus. Everything Dinosaur have already produced fact sheets on these prehistoric animals and sure enough, a Brontotherium fact sheet has been created, even though the scientific name “Brontotherium” is now regarded as a junior synonym of Megacerops – a genus name erected three years earlier by Joseph Leidy. 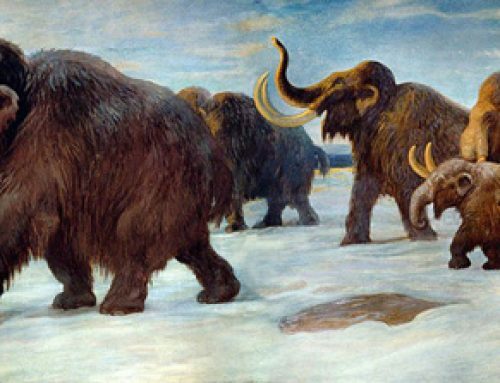 Such huge quantities of Brontothere fossil remains were discovered in the United States during the 19th Century that a great deal of confusion arose over the scientific description of these huge beasts. It is great to see that Mojo have included a classic Brontothere in their “Prehistoric & Extinct” model range. There certainly is much to admire in this prehistoric animal figure. A scale drawing of Brontotherium. For every fact sheet that we produce, Everything Dinosaur commissions a palaeoartist to produce a drawing. We use the illustration in a variety of ways, one of which entails the creation of a scale drawing so that our young fans can instantly see how big (or how small), the prehistoric animal was. The fact sheets we produce are part of Everything Dinosaur’s commitment to add value and to help to inform and to educate people about life in the past. We are not sure how the Brontotheres, such as Brontotherium – now assigned to the genus Megacerops, would react, these animals are renowned for their very small brains. The brains of big species of Brontotheres were only about a third the size of the brain of a modern horse (Equus). As the name implies, Everything Dinosaur’s fact sheets contain lots of facts and helpful information about prehistoric animals.